White on white sounds so easy, doesn't it? It can be challenging to make something that has enough zing power so all of the white elements work together. Thank goodness for embossing machines! Today's card also serves two purposes. 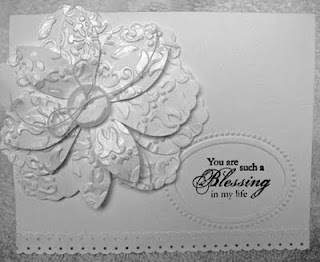 First, it is for the Blogger's Challenge, in which we were challenged to use Embossing this week. 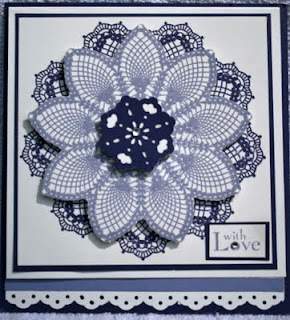 The LNS 131 Challenge this week was to make a white-on-white card. My card serves two masters! 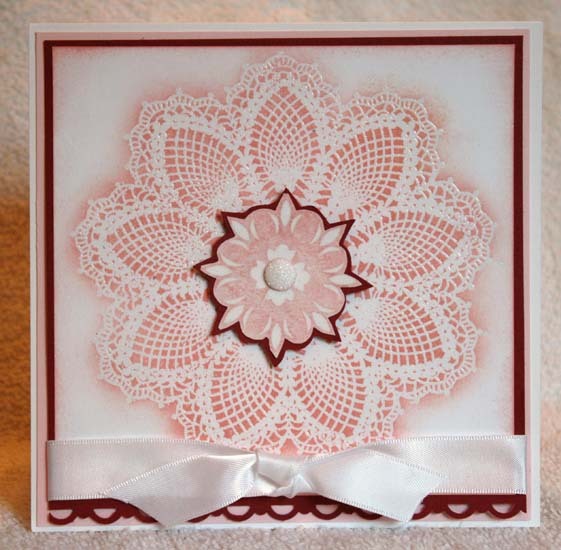 A tutorial on White-on-White can be found on the Emboss or Die CD. To make this card, I used Stampin' Up's Blossom Petals punch on a sheet I had embossed with the Vintage Wallpaper embossing folder. 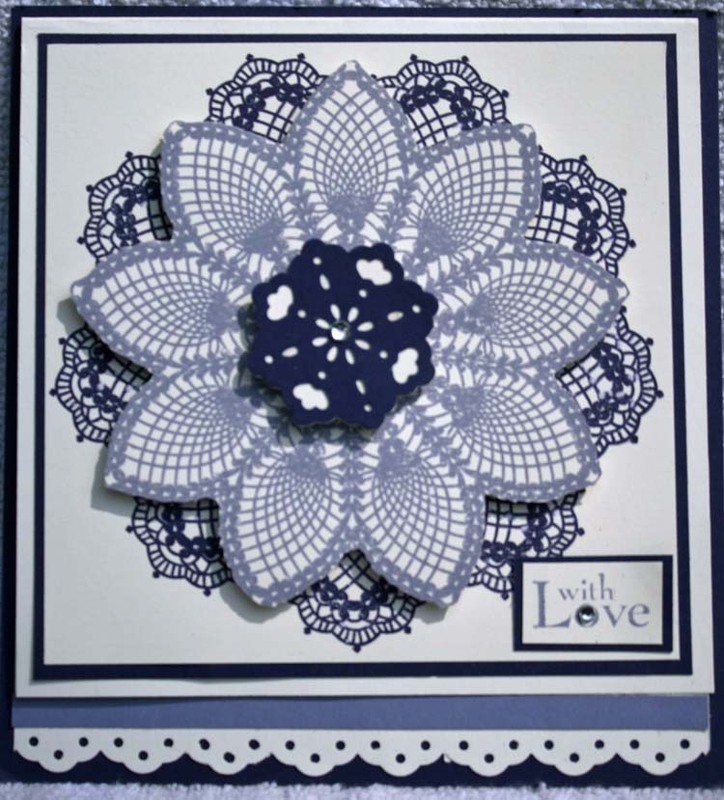 I punched the petals and arranged the flower on a piece I had embossed using the with the Designer Textured Frames embossing folder (this is a hidden gem in the new catalog!). I used the Blessings from Heaven stamp set for the greeting. The flowers were colored with White Smooch ink -- and they are heavenly in person. Oh -- I added the punch on the bottom, too -- thought it needed a final touch for balance. I had a really hard time getting a good photo of this card -- it is so pretty in person, and nothing I did seemed to capture that. I hope you get the idea! You can join in the Blogger's Challenge below -- just follow the links. Have a great weekend! August is upon us and I am thrilled to give you a sneak peek into the August issue of the Technique Junkie Newsletter. This card uses the Back-to-Back technique from the soon-to-be-released August issue. You are gonna LOVE this issue! Nancy lives in California. I live in Connecticut. Nancy comes here for 6 weeks every summer. she looked me up 3 years ago -- and every year since, we have come to appreciate each other more and more. It is rare to find beautiful people in this world; Nancy is one of them. I am proud to call her my friend. Plus...she makes me laugh. That alone is priceless!! With my recent SU purchase (um, it was rather significant), I decided that I would not rest until I had used each stamp set at least THREE times...which is why I seem to be posting the same stamp sets every day LOL! 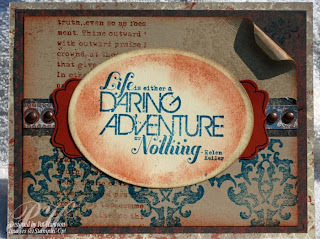 This is the second card that I made from the Daring Adventure set. 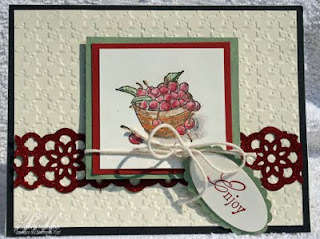 My card uses the Wisped Frames Technique from the February 2010 of the Technique Junkie Newsletter on the main image. I also used the Curled Corner Technique from the February 2011 issue of the Newsletter. The background papers I used for matting uses the Well Worn Designer Paper pack. I hope you are not bored from me posting from the same sets...because there are more to come! I love this little bowl of cherries. It is so sweet! 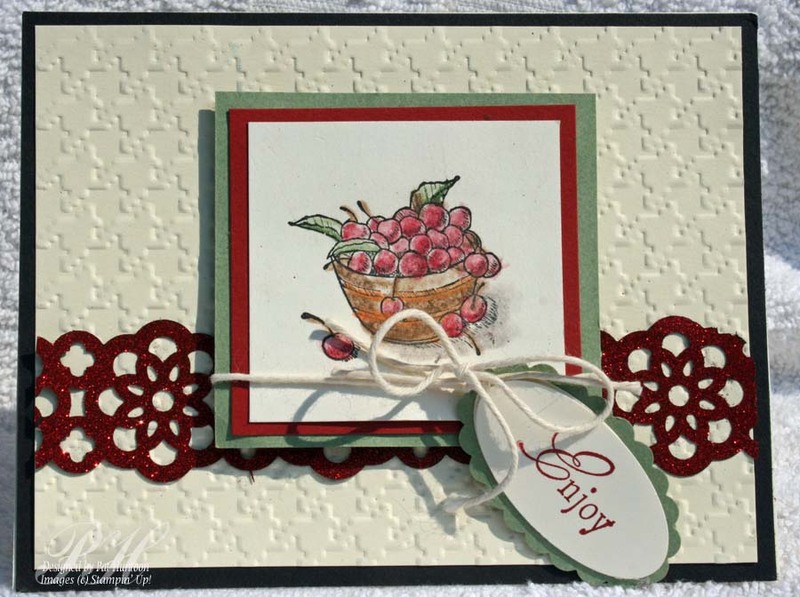 The stamp is from the Cherish Friendship set from Stampin' Up. I colored it with pastels and a blender pen.The hanging tag with the word "enjoy" is from the You're a Gem Set. To create the Lace Punch border behind the front panel, I used the Glitter Roll Technique from the June 2011 issue of the Technique Junkie Newsletter. I wish you could see the pretty glittery shimmer it has IRL! 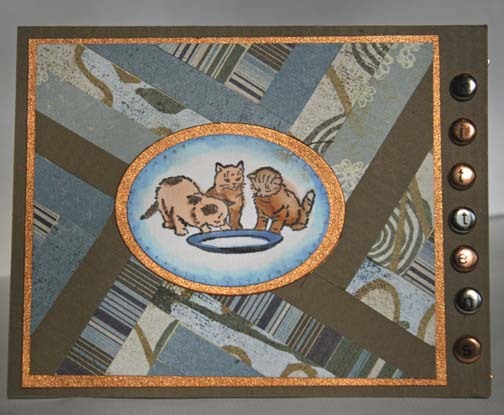 All of that was layered on a Herringbone embossed background before being matted. I started a post a few weeks ago (um, maybe it was a month ago- yikes!) with this Father's Day card that I sent to my dad. Somehow it got lost in the shuffle! I hope it will inspire you for what looks like, rather than the sentiment itself. 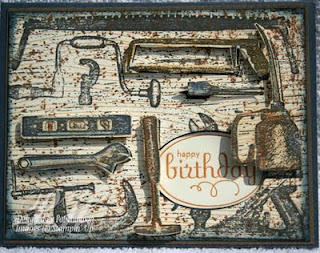 The card uses the Non-Stick Color Technique from the June 2011 issue of the Technique Junkie Newsletter. 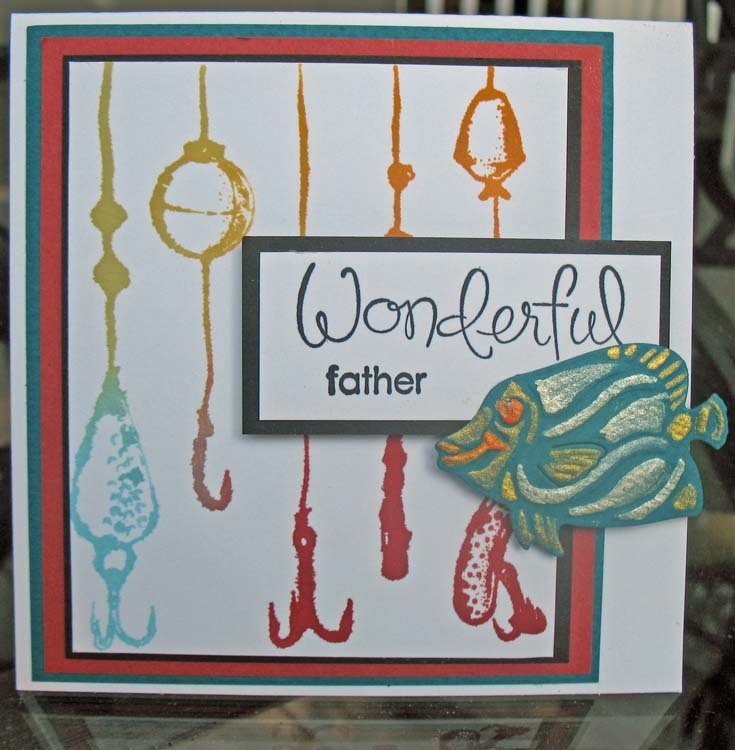 The cool fishing line stamp is from I Brake for Stamps (make sure to look on the sidebar to see the discount from IB4S when you order!!). Happy Father's Day (better late than never, right? Yes, you read that right. Kittens. If you know me, you know that I am not a cat fan (Dogs Rule!). I was in a swap a couple of months ago and I had made this card to represent the letter K. If you look closely you can see that the brads letters spelling "Kittens" on them. The card uses the Herringbone Technique from the December 2009 issue of the Technique Junkie Newsletter. The stamps are from Rare Image Rubber Stamps and are available through I Brake for Stamps. The brads with the letters have been in my stash for at least 6 - 7 years...I have no clue who made them! 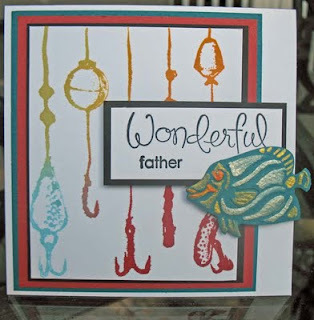 The designer paper is from Basic Grey and all the solid Paper is from Paper Temptress. Enjoy your Saturday! Sloppy, Juicy Lollipops. Summertime fare, right? 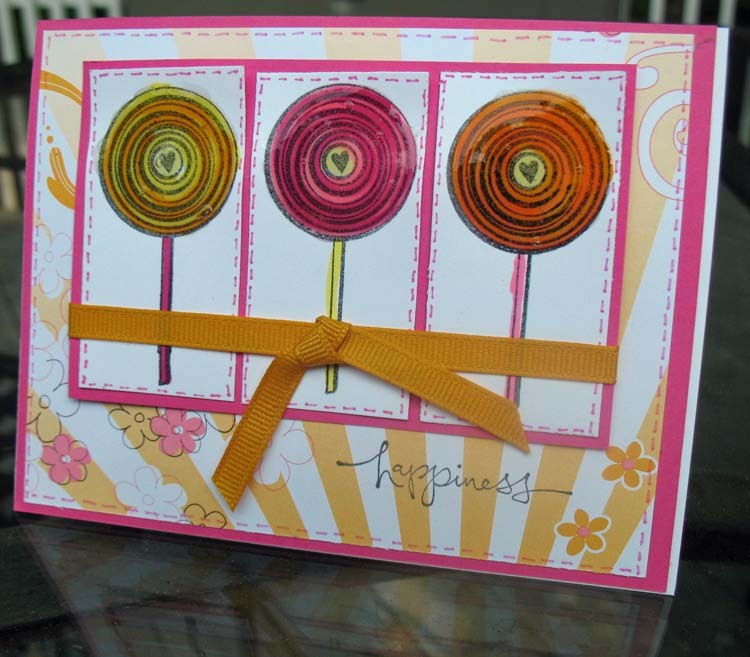 Well, today's Blogger's Challenge was to create a card representing summer. These lollipops, paired with the bright Stampin' Up paper (long since retired) just screamed summer to me. 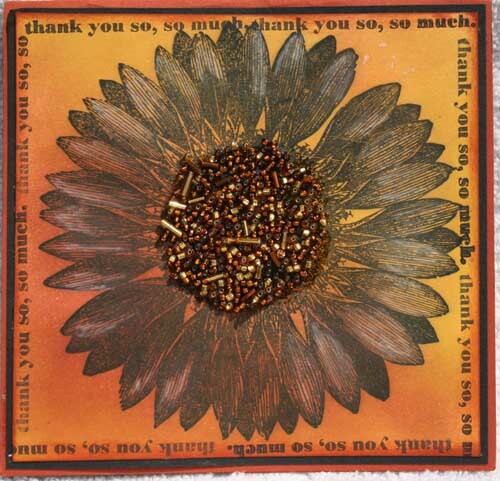 The Pink Paislee stamps used here were layered on pieces using the Faux Stitching Technique from the April 2006 issue of the Technique Junkie Newsletter. I covered each of the lollys with a coating of crystal effects to make them look more realistic. The only thing missing is the color they leave on your tongue when you lick them!! You can join in the Summertime Blogger's Challenge, too! Simply make your card and post it using the links below. Have fun! 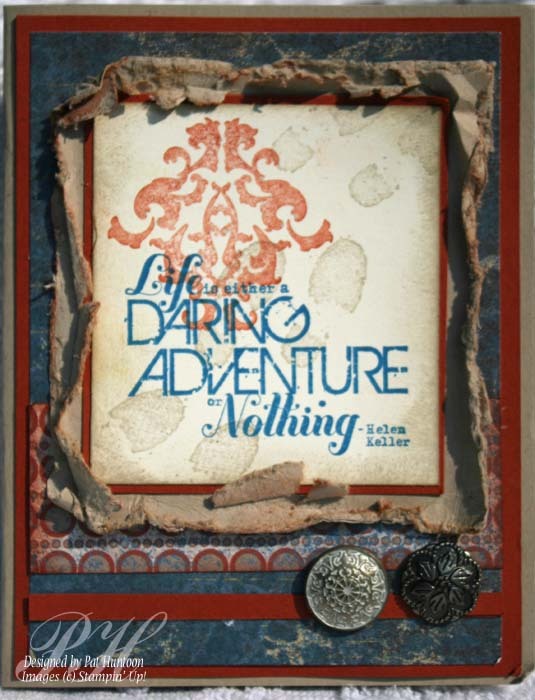 I was in heaven when I first saw the Daring Adventure set from Stampin' Up!. As the mother of 2 teenage boys, I always find it difficult to stamp cards for them that they think will be cool. This set definitely has that cool factor! 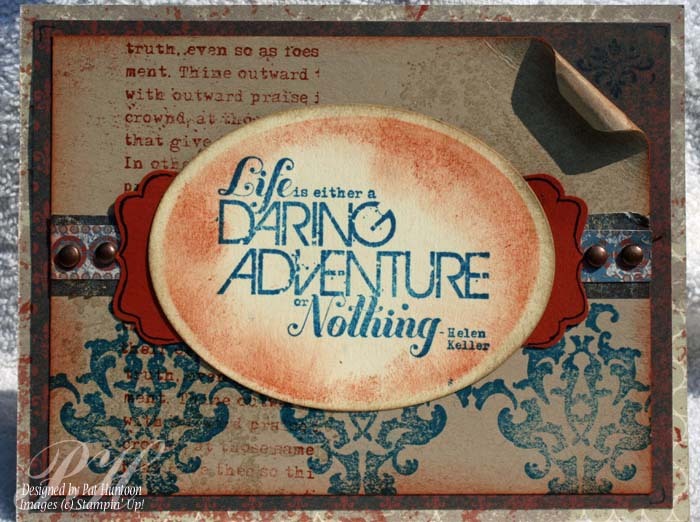 My card uses the Daring Adventure set with SU's Well Worn Paper pack, and Vintage Brads. The front panel has a Torn Frame from the December 2008 Technique Junkie Newsletter. I think I captured that teenage-boy X factor. What do you think? Have a great day, and take some time to laugh today! My Word! Where has the month gone? I have not posted for almost three weeks. Life has been crazy-busy for me personally, so things just fell off my plate. I didn't stamp for three weeks straight -- and after I convinced myself that I still remembered HOW, I went on a stamping jag...one that is not over by any means! Stampin' Up! 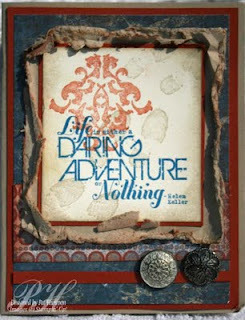 just came out with a new catalog (although I am certain that most of you know that!) and I "pigged out" on buying SU stamp sets. This one, Sunflower, caught my eye right away because of it's vintage feel. 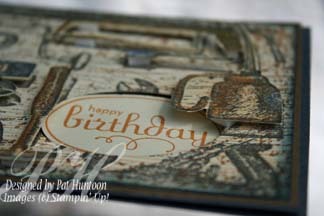 I thought it was perfect to pair up with the Vintage Art Technique from the June 2011 issue of the Technique Junkie Newsletter. I hope you like it! Strap in, my blogging friends...I have much to share with you over the next few weeks!